Scott Carr joined the Knights as Executive Associate Athletic Director and CMO on February 9, 2016. In this role, Carr oversees the Communications, Fan Development and Video Services units. Prior to his tenure at UCF, Carr served as Senior Associate Athletic Director for External Affairs at Auburn University. While at Auburn, Carr was responsible for the external affairs of the athletic department. He directly oversaw the marketing and promotions department, including ticket sales, box office, event management and community relations. Carr was also responsible for the game-day experience at all sporting events and dealt with all athletic department contracts including but not limited to ISP, Under Armour, and Sodexho (concessions). He joined the Auburn staff in August, 2009. 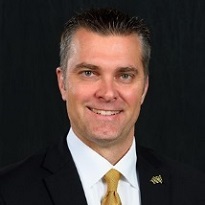 Prior to Auburn, Carr served in various capacities at Southern Miss from 2001 to 2009. The most recent position he held was Deputy Director of Athletics, External Affairs (2006-2009). Prior to Southern Miss, Carr worked in various capacities with the FedEx Orange Bowl in Miami, Florida (1997-2001). Carr is a native of Gainesville, Florida and earned his undergraduate business management degree from the University of Florida in 1995 followed by a master's in sports management from UF in 1997. Carr is married to the former Pam Snowe and the couple has two daughters, Ashton and Katie.